did you try to disable the "checklist" in the 2nd MCDU? 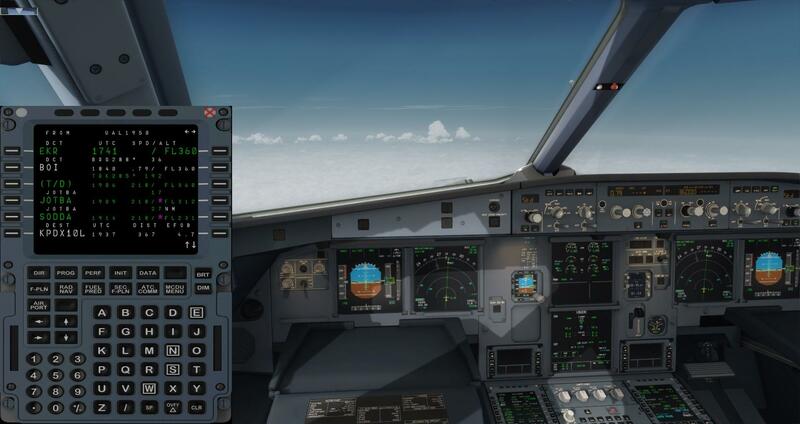 Disabling "Checklist" in my case has solved the speed issue in both climb and cruise phases. BTW, my version is 1.2.3.0. I have not, so you mean to tell me that disabling the first officer checklist could be a temporary fix? hmmmm....could the aircraft be entering approach mode prematurely? That's the only interaction I believe the first officer has with the A/T? is there someone who suffered the bug that was not using the auto checklist? I don't use the auto checklist and still have this issue.. I haven't been using the checklist/copilot and I have had the bug several times (though not since updating to 1.2.3.0). However, I do have those features turned on in the MCDU3 Options, I just haven't been initiating them at any time (I use FS2Crew). I don't believe I've changed options settings since the update. Thanks for all the reports so far! We have been able to get some clues what kind of other anomalies people are having while the issue happens. Those who are experiencing the issue, could you please take some screenshots of various PERF pages (preferably with PFD in view as well) and report if you see any anomalies there (especially on distances). Also let us know what speed the drop fall into for you and if DES/CLB is still working somewhat correctly with the selected speed or is it calculating the aircraft below profile. Videos, where all this is shown, would be best if you are able to take them. We understand how frustrating this is for some of you. It's one of our top priority issues to get our head around. Since users experiencing this issue are really the only source we have for investigation right now, we are thankful for all details you can provide so that we can get an idea what is causing this and how to fix it. Hello Jose! Steep dive issue is whole another issue and not related to this one. There is already a thread open about this one, and we are aware of it and already working for a fix. Thanks for the video. We are especially interested in what various PERF pages show while the issue is present. So if possible, could you take one which shows different FMGC perf pages. Thanks! Running fine in managed speed mode at .79 Mach. I did switch to some exterior views using the default commands in P3D bound to my TM 1600M, came back into cockpit view and speed dropped to 219 kts approaching BOI intersection. Went to manual speed mode until TOD. Could changing views cause the managed speed mode to drop? As luck would have it, just did test flight #2 for myself, and was all ready to take the videos, but no issues! Engaged AP/AT around 2000' AGL in managed mode, flew the entire flight just fine. No speed issues noted, and descent profile was correctly calculated. Each speed/alt restriction along the STAR was met with no problem. I'll try a third test flight later today and report back. @BuddyDog You are using an outdated version. Please uninstall your current Airbus, remove any remaining folders, reboot your PC, install the latest version 1.2.3, reboot and try again. Back in December I made several flights with the A320 using airways that crossed the BOI waypoint. I had speed control issues somewhere around that point as well. Wondering if there are potential Navigraph issues? Ok, so test flight number two yesterday (KDEN-KSLC) and I had no issues. After several attempts at disconnected and reconnecting both A/P and A/THR in order to recover from A/FLOOR mode, I was able to dial in a selected speed, which it followed. If I tried to re-engage managed speed, the wrong speed was again commanded, so I just left it an selected mode. I've attached a link to the video (too big to upload), as well as a .zip file; the zip file contains all log files, flight plan, saved flight files from after pre-flight (before takeoff), after takeoff (when everything was fine), while the problem was occurring, and then after I recovered. Hopefully this can help you shed some light on the issue. @med11043 Hi. Help me get some more insight. How did you get to A.Floor? Did ATHR command THR IDLE on FMA? Was there any change on the FMA? How did the thrust levers behave? There will be an update soon with more detailed logging for this issue. I am not able to reproduce this issue on any of my PCs so please if possible reproduce it with new update and send over the same set of files. I hope to narrow it down a lot with your help. As soon as the commanded speed dropped to 198 on PFD, A/THR commanded idle thrust (apparently) in an attempt to slow to that speed. Once it did, the thrust seemed to stay at idle, hence the A/FLOOR and then a gradual descent as, I assume, the only way it could maintain that speed without stalling? I disconnected the autopilot, then tried to disconnect the autothrottle so I could recover from A/FLOOR, but the auto-throttle would not disconnect. I then reconnected autopilot and tried again. After doing that several times, while moving the throttle levers all over the place, the throttle levers finally started responding. The thrust mode changed to THR/LOCK, which I was then able to override by disconnected then reconnecting auto throttle (after moving thrust levers to idle), then I moved the lever back to the CLB detent, at which point I was able to go into selected mode, select a speed (in this case I did 290 knots), which the auto-throttle then increased the thrust until meeting that, and I was able to hold 290 knots in selected mode. Yes as soon as the update is out I will download it, then try to re-create this flight and send over the same files. I have had this issue in all released versions since I first downloaded the product on October 30, 2018. The issue has occurred on every flight either during climb or cruise and I have not successfully flown a single flight so I can understand some of the frustration being expressed here. The issue has occurred with and without checklist and with and without co-pilot. I have no add-on weather package or anything else. It is not clear if the development/debugging team has received enough customer input on the issue - but under the theory that too much is better than too little I am attaching a saved flight that always results in the issue and a log file up to the point where things start to go wrong. I have had this issue in all released versions since I first downloaded the product on October 30, 2018. The issue has occurred on every flight either during climb or cruise and I have not successfully flown a single flight so I can understand some of the frustration being expressed here. I understand this is frustrating, But as you will have seen here there are dozens of reports of people NOT seeing any problems in flights and it took us weeks to find the conditions that made it reliably reproducible on our test machines. If it happens in every flight on your machine there simply HAVE to be additional factors. Hello, I have still the issue with loosing mangaed flight speed now only at cruise. I just flew some days not with the aerosoft so i wantet to do a flight again with the aerosoft airbus. I flew from EDDH to LIRF with the A320 CFM. i was doing some thing in my home and suddenly i heard the sound from Airbus and i saw that the Airbus was only 140 fast in stall speed with toga lk activatet and already lightly stalling the managed speed droped in the mid of the cruise to 120 knots. on climb was all good. That bug become for me more and more frustrating it make no fun to fly this plane with this bug. The airbus has the newerst version 1.2.3.0 and i have installed it with administrator rights and antivirus was off. i had this problem few weeks ago too see my older post. But there was the problem already on climb in this flight only on cruise. I reinstalled 1230. Flew SAN-PHX. This time before pushback, I moved my joystick slider full forward(max power), kept them there and used my keyboard for throttles. No speed problems. However using Nav Data Pro the speed target would not change for speed contraints until crossing the waypoint so I would always be to fast. I, too, am having speed issues with version 1.2.3.0. So, how does one "turn on logging." And then, where do I find these logs to view afterwards? Just an aside question, when the bus hits the top of climb, is the indication on the ECAM supposed to turn from "CLB" to "CRZ?" Or, is that just an indication of the throttle detent setting?